This two-story frame Arts & Crafts style house was built for Amon F. Sanderson and was designed by Ward Wellington Ward. 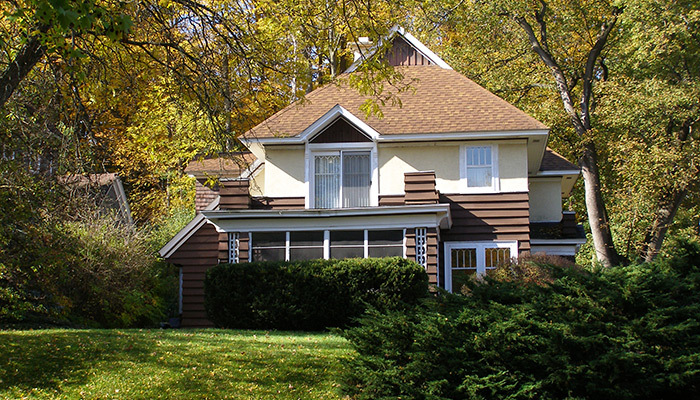 The house exemplifies Ward’s Arts & Crafts style and also the related Prairie style. Among the distinctive features of the house are its gable-on-hipped roof, cedar clapboards in wide and narrow strips, decorative lattice-work and gable designs. A one story porch faces Scottholm Terrace. many of the porch material are replacements, but the form is nearly identical to the original, which is known for old photos. Inside there are Mercer tiles around the fireplace, leaded glass cabinets and many original finishes and fixtures. The house is one of five similar homes in Syracuse designed by Ward. The others are at 464 Allen Street, 100 Berkeley Drive, 1917 West Colvin Street, and 116 Rugby Road. In 1919, Sanderson bought a parcel of land north of the house and erected a garage, possibly also designed by Ward. Amon F. Sanderson was a former clergyman who became a developer of residential neighborhoods, especially on the Eastside of Syracuse. In city directories he is listed as president of the Scottholm Company in 1922 and secretary of the Eastern Land Corp. in 1920. Sanderson later (1922) commissioned another house from Ward at 301 Scottholm Boulevard, also on this tour. #112 was Sanderson’s primary home and he lived here until his death in 1959, when his daughter, Ruth Sanderson inherited the house where she then lives through the late 1970s. The house is now occupied by realtor Donald Radke, who has served for many years as the Chair of the Syracuse Landmarks Preservation Board. “A. F. Sanderson Dies at Home,” Syracuse Post-Standard (Sept 16, 1959). Carlson, Richard. “Sanderson House, 112 Scottholm Terrace. National Register of Historic Places Registration Form,” (1996).